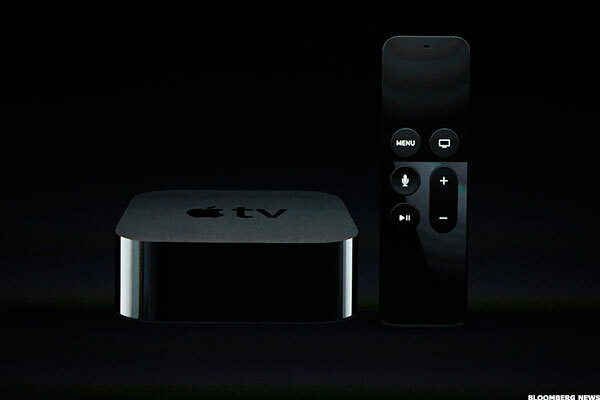 Is an Apple TV Guide the Company's Next Big Thing? The tech giant has reportedly been focusing its TV efforts on developing an easy-to-use content guide, but Apple might be better off just pursuing a skinny bundle of channels. Apple's (AAPL - Get Report) TV efforts have undergone several plot twists in recent years, but its latest strategy finally appears close to ready for prime time, just in time to further boost the tech giant's new focus on services revenue. According to a recent report from Recode, Apple plans on developing a TV guide that will allow users to navigate programming more easily via the Apple TV user interface. The company would reportedly explore the possibility of a single sign-in for the many services that a user may be subscribed to, such as Netflix and Time Warner's (TWX HBO GO. Apple's stock is up about 13% since its close on July 26, after which it reported better-than-expected quarterly earnings. TheStreet's Jim Cramer wrote on Real Money on Tuesday that Apple's stock price move has been a prime example of a short squeeze. For a technical look at whether Apple's stock can break loose even further and regain its November highs, please see this Real Money story from Bruce Kamich. The latest news about the Apple TV follows the Wall Street Journal's recent report that Apple was exploring the possibility of developing a skinny bundle last year, before tabling the idea because of failed negotiations. That project would have offered a vast library of on-demand movies and television shows, combined with live TV from broadcast networks. The idea was promising, but the Journal reports that Apple executives were too cocky in the negotiating process, remaining stubborn about their pricing and bluffing network executives into thinking that Apple had already made deals with other networks. As a result, Apple was unable to pull together the skinny bundle that it wanted. However, the company still recognizes the need for innovation in the TV sector to boost flagging sales -- hence the TV guide. Currently, Apple TV sales are lagging behind those of its three main competitors -- Roku, Google's (GOOGL - Get Report) Chromecast and Amazon's (AMZN - Get Report) FireTV. Apple does not make sales figures for its TV units available in earnings reports, but last October Tim Cook said that the company had sold over 20 million units of the product. That's uninspiring when compared to the billion iPhones that have been sold around the world. In order to move more Apple TV units and pull consumers further into its ecosystem, the company understands that it has to beef up its product and more generally, generate more revenues from services. Indeed, Cook recently crowed in a tweet that App Store developers have earned over $50 billion, and the App Store last week sent an email to customers encouraging them to download and play Pokémon Go. Currently, Apple TV is a digital media player that can stream content from the iTunes Store, Netflix, and other online content providers. It costs $199 to purchase the Apple TV hardware, which is on top of the money it costs to subscribe to services such as Netflix and HBO GO. The proposed TV guide will certainly make it easier for users to find their desired content, but whether it will be enough to compel people to go out and replace their current set-top box with Apple TV is another story. Apple is a holding in Jim Cramer's.Action Alerts PLUS Charitable Trust Portfolio Want to be alerted before Cramer buys or sells AAPL? Learn more now. John Conlon, chief equity strategist for People's United Wealth Management, believes that the TV guide could pave the way for a future skinny bundle. "If you can capture people using this service, it's a lot easier to go to content providers and say, 'We have all these people for a potential skinny bundle,'" he said. Conlon cited the iTunes store as a precedent, as Apple was able to eventually enlist more artists because of the large number of people who had signed up for the service. However, Laura Martin, senior analyst at Needham & Co., sees a more difficult road ahead for Apple's TV guide. "There won't be demand for the product until it makes a deal with some of the larger service providers," she said. For subscribers of Comcast (CMCSA - Get Report) or Charter's (CHTR - Get Report) Time Warner Cable, the TV guide will carry little appeal if users aren't able to access broadcast shows through their service provider. The smarter move for Apple to accelerate TV sales, according to Martin, is to turn attention back to the skinny bundle idea. "It is easy for Apple to do a skinny bundle; they just have to pay the money," she said. "They just want a discount, because they're Apple. The notion that they can't get a deal done is preposterous." Indeed, the Journal reported that there was interest from broadcast networks about a potential skinny bundle deal before Apple demonstrated inflexibility. The company pre-determined the worth of broadcast networks such as Disney (DIS - Get Report) and refused to budge on their offers. Apple Senior Vice President Eddie Cue also reportedly played his cards too close to his chest, refusing to show network executives the proposed user interface, or giving them anything but nebulous details about the proposed bundle. "The big problem was their inflexibility," Conlon said. "Apple has a great delivery vehicle with Apple TV; they just have to realize that they need a new pricing model." Apple's obstinacy may have been due to the company's confidence in its ability to gain new viewers with or without the broadcast networks aboard. Part of the company's recent TV strategy has been the development of new content, as reported here at TheStreet. The company is developing a reality program about app development and will debut a semi-autobiographical Dr. Dre show through Apple Music later this year. Apple also recently purchased the rights to develop "Carpool Karaoke," based on a popular segment on James Corden's The Late Late Show. While these shows may prove popular, they likely won't be enough on their own to convince consumers to sign up for Apple TV. They could, however, significantly enhance a skinny bundle in which customers would have access to these shows, plus live television and a large content library. Developing such a project would also help expand the Apple brand beyond just the iPhones and computers it's best known for, and into television. Whether or not Apple's TV guide is a smart first step toward that end-goal remains to be seen. "For now, the user interface is a good idea, and is consistent with Apple's strategy to be both a hardware and a software supplier," said Martin. "However, it's simply too early to tell whether it will be successful." Indeed, the TV guide could be a successful development for Apple TV and persuade more viewers to join the service. Or, it could fail to attract attention, and the company would be back to square one in terms of negotiating with networks for a new skinny bundle. Even if Apple TV sales see an uptick from the new feature, however, don't expect an iPhone-level sensation from the company. "They're not the pioneers here; they don't have the market to themselves," said Conlon. "But you should never say never with Apple."